With the change and evolution of modern technologies, businesses big and small are doing everything they can to keep up. For it is the process of attracting targeted audiences to the company and brand that will spell the difference between a successfully thriving business – and a failed one. Sharon McMahon, the digital mastermind at the Worldwide Speakers Group, is the in-house expert at all things graphic design, aesthetics and digital marketing. She shares her inside views and just exactly what it means to keep up (and excel) in the digital world. Q: Why are digital marketing and the graphics that come with it so important nowadays? Q: How does this relate to a company’s brand experience? Q: What is WWSG’s brand experience and how did you create it? Q: What is the biggest challenge in terms of branding and digital marketing at WWSG? S: “Because we are a lecture agency, we serve both speakers and clients. A big challenge is working to market these speakers and our company while keeping the authenticity of the speaker’s brand, but tying them to ours as well. This comes up when we are announcing a new Exclusive Speaker. We need to put our branding on the speaker and also want to keep their originality. We use our WWSG template that gives our clients their first image of the new speaker with our logo, therefore being associated with us. Q: How does WWSG’s Digital Marketing set you apart from competitors? Q: How do you choose the graphics you use in these pieces? S: “Firstly, it depends on what kind of marketing material it is. Then I begin to play around with what I find to be the most attractive to a reader. I make different mock-ups and decide which one grabs my attention. I am also constantly paying attention to other emails I receive, and I am subconsciously making note of the ones that I most pay attention to and that worked on me. This is a way I get inspired. Q: What has been your favorite digital marketing or graphics project at WWSG? Q: And what is one of your favorite images/logos you’ve designed for WWSG? S: “My favorite is the World Map. A collage of our Exclusive Speaker’s faces makes up the layout of the map. I loved the idea of a map layout and the fact that it provided potential customers and clients with a subliminal message. 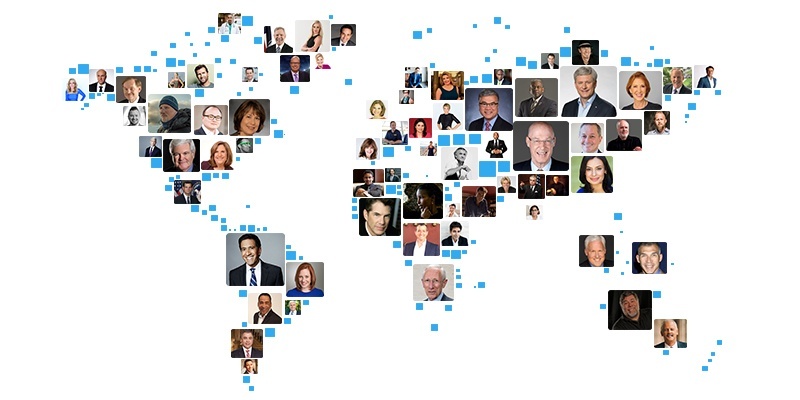 We represent speakers and clients from all over the world, hence our name the Worldwide Speakers Group, and the world map is a tie to that. Digital marketing and graphic design have slowly become more and more important to all companies. More engagement and attraction mean more sales and revenue. It’s all a cycle and all comes back grabbing the attention and developing that long-lasting relationship with the customer.